CCDG is proud to be the exclusive Development Advisor for [email protected], providing guidance on every aspect of the development process of this project. Mr. Behdad serves as the chief advisor for the selection of every member of the project team; from architect to engineer, to the environmental and historic preservation consultants, even so much as selecting a landscape designer. CCDG supervises every operation of the project including the land-use, entitlement and governmental affairs. Needless to say, without CCDG and the expertise of Hamid Behdad, [email protected] would be little more than an idea. 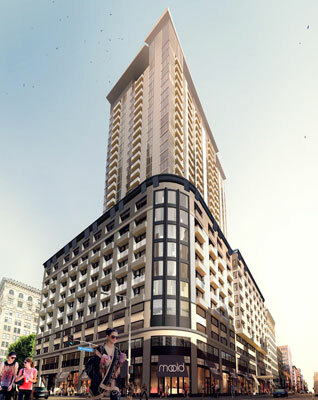 [email protected] is the first ground-up high-rise condo tower to be built in the Historic Core of Downtown since the turn of the 20th Century. [email protected] will give Los Angeles residents one of the most sought-after properties to come along in years. CCDG, with their extensive understanding of residential real estate, knows how important it is for area residents to be within easy walking distance of good jobs. This area, with its easy access to downtown Los Angeles, is one of the top places to be due to the centralized location, and will be the catalyst for future development to the Historic Downtown Area. The residential units will offer 450 suites covering 34 floors (36 levels) and totaling 444,099 square feet. A lobby area that opens onto Broadway will greet residents as they arrive home. Floor plan options include 69 studios, 224 one bedroom units, 39 one bedroom units with a den, 117 two bedroom units, and one penthouse. Private balconies will allow the majority of residents to watch all of the activity in the neighborhood and enjoy the warm, sunny weather. The low energy glass windows in the units will help keep excess heat from getting in, allowing everyone to enjoy comfortable temperatures all year and experience lower energy bills. Over 6,904 square feet of retail and other commercial space will be available at the ground floor level for local businesses to inhabit, providing residents the option of being able to travel downstairs to shop, bank and possibly find work, an excellent option in today's fast-paced world. The amenities level on the 11th floor will feature a landscaped podium and other nice touches such as a community room, theater and conference room, to name a few. The fitness center and spa will allow residents to indulge in exercise and relaxation without having to leave the building. Other excellent amenities that will be available to residents include a swimming pool, Jacuzzi, theater, business center, community room, etc…. all of which expected to get plenty of use. Residents and commercial real estate users will have access to 450 parking stalls for cars and approximately 500 parking and storage stalls for bikes. This ample parking gives residents peace of mind knowing that their vehicles are safe. Local residents will be encouraged to take advantage of the bike storage to commute back and forth from downtown by bike; an eco- friendly and cost effective source of transportation.